any dexterous procedure; see also method, operation, procedure, surgery, and technique. For names of specific maneuvers, see under the name. A planned movement or procedure. /ma·neu·ver/ (mah-noo´ver) a skillful or dextrous method or procedure. Bracht's maneuver a method of extraction of the aftercoming head in breech presentation. Brandt-Andrews maneuver a method of expressing the placenta from the uterus. forward-bending maneuver a method of detecting retraction signs in neoplastic changes in the mammae; the patient bends forward from the waist with chin held up and arms extended toward the examiner. If retraction is present, an asymmetry in the breast is seen. 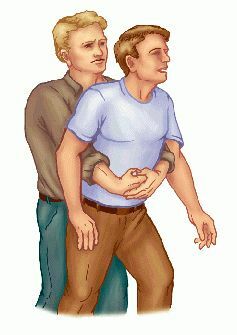 Heimlich maneuver a method of dislodging food or other material from the throat of a choking victim: wrap one's arms around the victim, allowing their upper torso to hang forward; with both hands against the victim's abdomen (slightly above the navel and below the rib cage), make a fist with one hand, grasp it with the other, and forcefully press into the abdomen with a quick upward thrust. Repeat several times if necessary. Pajot's maneuver a method of forceps delivery with traction along the axis of the superior pelvic aperture. Pinard's maneuver a method of bringing down the foot in breech extraction. Prague maneuver a method of extracting the aftercoming head in breech presentation. Scanzoni maneuver double application of forceps blades for delivery of a fetus in the occiput posterior position. Toynbee maneuver pinching the nostrils and swallowing; if the auditory tube is patent, the tympanic membrane will retract medially. 1. increase in intrathoracic pressure by forcible exhalation effort against the closed glottis. 2. increase in the pressure in the eustachian tube and middle ear by forcible exhalation effort against occluded nostrils and closed mouth. 1 an adroit or skillful manipulation or procedure. 2 (in obstetrics) a manipulation of the fetus, performed to aid in delivery. Also spelled manoeuvre. noun Any form of management or procedure that acts on a patient to evoke a result or outcome. noun A procedure or series of movements that require skill. verb To perform a series of movements with caution and skill. Medtalk A method or technique for performing a task. See Abdominal thrust maneuver, Doll's head maneuver, Epley maneuver, Flake maneuver, Hallpike maneuver, Head-tilt/chin-lift maneuver, Heimlich maneuver, Jaw thrust maneuver, Jendrassik maneuver, Lichtenstein maneuver, Semont maneuver, Triple airway maneuver, Valsalva maneuver. n a skillful procedure or manipulation. He pointed out that the student who learns a maneuver through GIFT in the simulator will generally find that it's easier to fly once she gets into the airplane, making for a positive learning experience and even more rapid mastery of the maneuver. 7) When swarms face one another, the speed of the swarm's coup d'oeil--determined by algorithmic efficiency and processing power--may decide the outcome of battles, and if robots ever become the military's primary maneuver arm, a force's mobile computing capabilities may be a key component in evaluating its overall combat power. Patients will be reviewed on 7th day after performing Epley maneuver. All warfighting functions support the maneuver commander in the command of forces conducting operations, regardless of the mission. In these maneuver, the head is positioned such that loose otoconia are allowed to sediment within the labyrinth. The AFH goes on to note, "An important benefit of performance maneuvers is the sharpening of fundamental skills to the degree that the pilot can cope with unusual or unforeseen circumstances occasionally encountered in normal flight. 0] is the initial maneuvering frequency, M is the high maneuver detection threshold, generally taking 3 . The Conclusion was: yes, upper airway change during a Mueller's maneuver does predict the severity of OSA. In this FCPF algorithm, detecting the maneuver of target is one key point to achieve good performance. The future will require us to employ the movement and maneuver concept, which is based on the premise that the central focus of the force will dominate the close fight; at the same time, it recognizes the need to protect the population and calibrate the amount of force used in areas where we must set the conditions for an ally to succeed. The maneuver proved the ability of the Iraqi forces to control all areas of Diala, which were described as "hot". The maneuver, called the Lion's leap, included bringing airborne forces into the field, evacuation of the wounded by helicopters, providing fire back up in addition to command, control, and coordinate in running a joint military operation of the Iraqi Army commands.